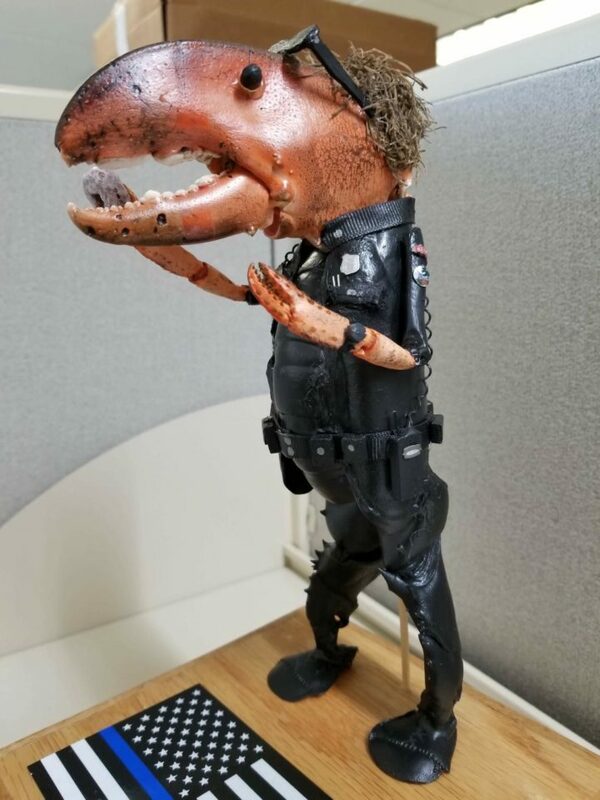 Detective Dustin Dow's friend, Bob Albert of Millinocket, builds interesting characters out of discarded lobster shells. Maybe you came to Maine to eat lobster. We appreciate it. The part of the equation that you, the accidental tourist, might be missing is that we locals enjoy watching the novice crustacean consumer try to eat their first steamed lobster. A high percentage of Mainers don’t have cable, or any access to Netflix, Amazon Prime, or any of the other movie streaming services. We go out for a cheeseburger on Friday and we cross our fingers that someone nearby will be eating their first steamed lobster. DO NOT have your server tie the white plastic bib around your neck while you take a selfie. It’s like a beacon of what is to become a butter infused display of all that is good about America, Maine, and tourists with greasy little fingers. Naturally, we will watch. DO NOT use the white plastic bib at all. Just wear older clothing and skip the bib. Wiping your hands on your pants or shirt will also make people lose interest in watching you any longer — unless you are wearing khakis — we will still watch if you wipe your hands on pressed khakis. DO NOT, I repeat, DO NOT use empty lobster claws as make-shift finger puppets. Your neighbors at the next table don’t want that, and we urge you to avoid it. If using the claws as make-shift finger puppets, DO NOT try to mimic a Maine accent while talking with the claws. If you say, “How you doing’ chummy, I am Larry the lobster” to an actual Mainer while using the claws as puppets, you are going to need to find a proctologist to remove the rest of the shell. Pro-tip: proctologists are hard to find in most coastal communities, which will lead you to seeing a general practitioner. They are not as skilled at the less-than-invasive removal techniques. You are gonna need a bite-stick and whiskey, and probably some of that butter that you cannot get off your fingers; that stuff is very slippery. In any event, those khakis are gonna need to go into the dumpster. Lastly, DO NOT use the joke “What’s worse than lobsters on your piano?” We have all heard it, and it makes everyone from Maryland angry when you use their delicious crabs as part of the punchline. Don’t even get me started on how angry it makes the Wurlitzer repairman, they hate that joke. After writing about the things you shouldn’t do with a steamed lobster, I remembered Detective Dustin Dow’s recent acquisition. Dow’s friend, Bob Albert of Millinocket, builds interesting characters out of discarded lobster shells. A few weeks ago, Bob gifted Detective Dow a desk ornament created from repurposed crustacean parts. I knew there would be a time when I could present this novelty to the loyal followers of the world’s most marginally famous Bangor Maine Police Department Facebook page. I got in late last night after helping Sgt. Beaulieu’s daughter move to her new apartment. On a side note, how come college kids always find an apartment on the second or third floor with an entry door which is well under the standard width? I digress. After we finished, we went to Orono’s world famous Pat’s Pizza and I discovered that Wednesdays are 99 cent fresh cut french fry day. Yes, I also had a double pep/mushroom pizza; judge not lest ye be judged. Needless to say, there comes a time in a man’s life when he realizes that neither one of the aforementioned options are really the best way to prepare yourself for a good night’s rest. 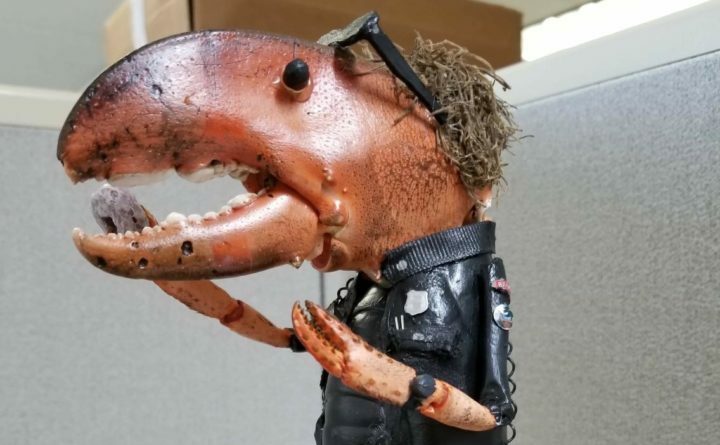 So, with little sleep, and nothing to write about, I was thankful for Dow’s new Lobster Cop character, and … Bob Albert’s crafty hand at repurposing discarded lobster shells. They are far more detailed than simple lobster finger puppets, and he has made about 50 different characters, from woodcutters to ballerinas — all out of lobster shells. Each one takes about eight hours to build. The detail is pretty cool. 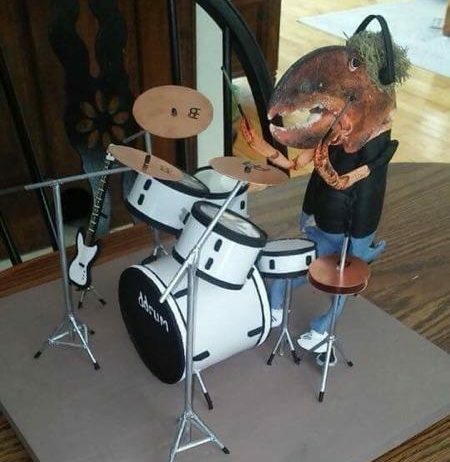 Made entirely out of lobster bits. Welcome to Maine. If we get bored, we head right to the recycle bin. Yes, the doughnut in the cop’s hand is a chocolate Cheerio, because Bob Albert is a creative and funny guy. Always with the doughnut … sheesh. Welcome to Maine. Enjoy your summer.